From this point on, I could not access the administration panel anymore… So what could I do? That’s all… If this didn’t work for you, it may be other kind of problem… In that case, take a look at the comments section of this post, since there are some people which found other solutions. Ack! This happened to me too. In an attempt to fix it, I deleted the plugin via FTP. I should’ve googled first! Would you be able to instruct me how to fix it now? D-oh! 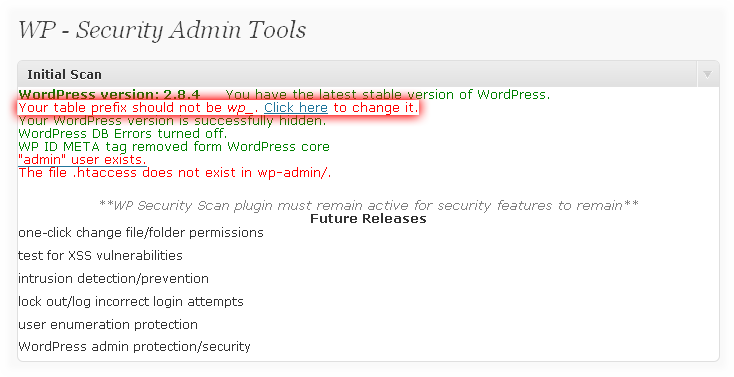 You can just “re-install” the plugin via FTP decompressing it int the wp-content/plugins/ directory so you’re at the previous situation and then follow step by step the instructions I posted. Thank you, I had exactly the same permissions problem. It never would have occurred to me that the database tables would contain references to other table names. My programmer sensibilities are offended. But well, we can always learn now perspectives (no matter whether we like them or not! :))! Thank you sooo much. That was the solution to my problem. 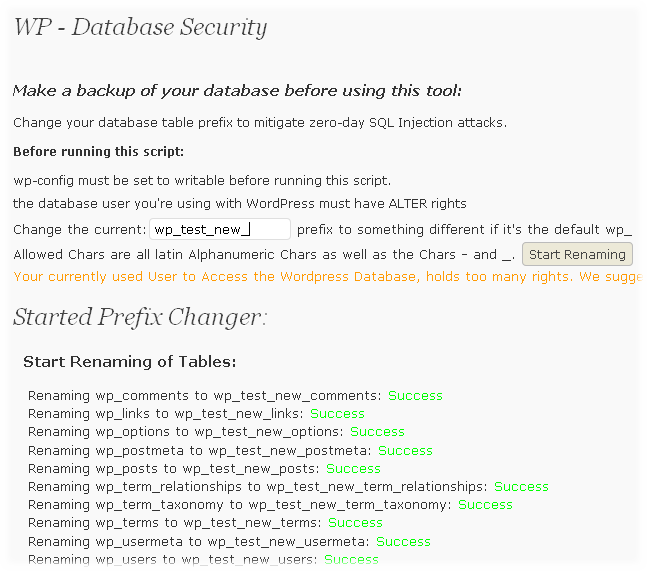 I was migrating several wordpress databases into a new MySQL 5.0 server and wanted to name the prefixes differently to tell the wordpresses apart. Thank you Paul for your comment! I’m very glad it helped you! Thank You So Much!! 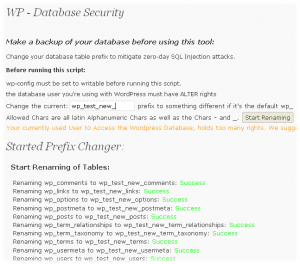 I updated my database prefix with the instructions at http://tdot-blog.com/wordpress/6-simple-steps-to-change-your-table-prefix-in-wordpress when the Security Scan plugin didn’t work for me. Everything went smoothly except for the permissions problem and I spent 2 aggravating hours trying to fix it before I stumbled across this solution. Thanks again! Thanks David for your comment! I’m glad the post helped you! Aah! Your solution did the job! Thanks! Thank you, thank you, thank you! I manually updated my prefix and got the error. Your generator worked great. Excellent post! Thanks for this post. You saved me hours of searching on how to fix this problem! I used the same plugin and had exactly the same problem. Your quick SQL code generator gave me just the right incantation to regain control of my blog. Thanks! Muy buen script para generar el codigo sql. Me ahorraste horas!! Gracias, tuve el mismo problema. Pero en mi caso el re-nombramiento lo hice manualmente. Brilliant! Thanks so much, spent the last 2 days trying to solve this! Hola. Muchas gracias por el generador porque permite avanzar bastante en la realización de estas funcionalidades. Un saludo. Buenísimo que te haya servido! Me ha ido de perlas. Muchísimas gracias!!! Hello, I have a article directory http://isearchquest.com/articles, i have the same problem, i have deleted “Article Directory” and “Role Manager” plugin and then re-installed, Second – i still have the same database name “wp_” haven’t changed that, third- i have updated my wordpress automatically to 3.0.1 but my problem is there although i can access the account by my “admin” privileges but a normal user (author) cannot able to login. This doesn’t seem to be the same problem. Espero puedas ayudarme, muchas gracias de antemano. Fijate en la config de tu hosting. Perfecto! me has ayudado mucho, sigue así!!! gracias! me paso exactamente lo mismo que a vos… me salvaste de un dolor de cabeza. Oh man… you rock! I looked all over for a fix. I especially like that you created a sql generator to produce the code. Awesome! Super easy to fix. Hola NeoEGM, sé que es un post antiguo pero me encuentro ahora con este problema. Mi error ha sido provocado por otro plugin, Theme Teaster concretamente. El caso es que no sé qué prefijo nuevo debo poner en el generador que has creado. ¿Lo dejo igual? En ‘Prefijo Anterior’ dejo ‘wp_’ y en ‘Prefijo Nuevo’ dejo ‘wp_nuevo_prefijo_’ ?? Luego ese codigo SQL generado dónde lo inserto? disculpa mi ignorancia en estos temas pero apenas me manejo con las bases de datos SQL. I did exactly what you said but it still doesn’t work! 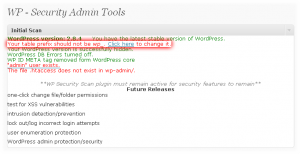 This all began after changing the database prefix with the WP-Security-Scan plugin… I did the same in other blogs of mine and nothing wrong happened, but this time was a complete disaster. I have the same problem. But I don´t know sql. I don´t find the prefix table field to change. I must choose SQL o generate consult. Please, you can explain how to do it, with more details. You can send me a email with instruccions. genial me ayuda xd que bueno esta gracias…. Diagnóstico exacto, me solucionó el problema. Muchas gracias por tu trabajo. Gracias por tu comentario! Me alegro de que te haya servido! Saludos.